The Long Well Walk is a Sheffield based charity working to tackle water poverty in Africa. We are a small, transparent volunteer organisation focused on raising awareness in the UK, and working in partnership with small organisations in beneficiary communities, develop effective and sustainable water projects. 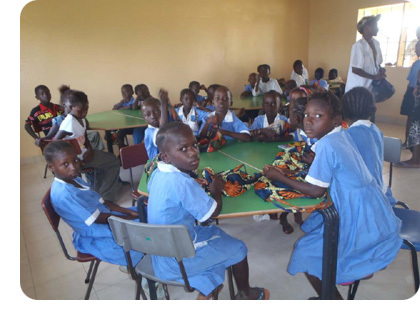 Sponsoring Academic and Medical Access was born out of a small village nursery in Wullingkamma in the Gambia. Built by another charity it had pretty much been left to its own devices with no trained teachers, curriculum or way forward. Delyth Dallimore moved to the Gambia and became involved by writing and organising a curriculum. The numbers of children grew at the school as sponsorships for the neediest children were found from visitors to the Gambia wishing to visit a school. A medical fund was established to treat very ill children (one in five children die before the age of 5 from malaria). Over the past 4 years thes school grew into a full nursery of children, aged 3 to 7, with the vast majority being sponsored. In March 2012 a group of like minded people met to discuss the possibility of building a school for the next level of education (children aged 7 to 11). With pledges of money raised the build began in April. The school was finished in the same week that it achieved official charity status.